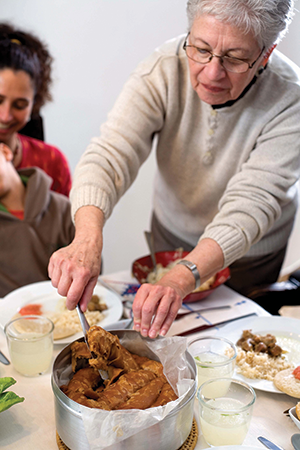 Sue Spertus Larkey serves up a Yemenite dinner. All photos courtesy of Daniel Laila. ​Sue Spertus Larkey frequently encountered questions of this nature while researching her new cookbook, Bone Soup and Flipped Bread: The Yemenite Jewish Kitchen (Modan/Gefen). But as soon as Yemenite cooks realized Larkey was a serious student of their craft with a genuine desire to preserve and share Yemenite traditions, they opened both their hearts and kitchens to her. ​“These women are so committed to preserving their culinary heritage,” Larkey, 78, said of the Yemenites she spent years cooking with to get the recipes and stories right. She had henna painted on her hands, attended baby namings and holiday celebrations, and drank countless glasses of tea while breads baked and soups simmered. ​Larkey—a Hadassah life member who belongs to the Tamar Chapter in Jerusalem—has a long culinary history in Israel. Active in Zionist youth movements during her childhood in Chicago, she moved to Jerusalem in 1970 with her then-husband and their four children. Through a catering business she ran with a close friend, she became exposed to the wealth of immigrant cooking traditions in her adopted country, leading her to write a well-received baking book, Lehem Tari (Fresh Bread), in 1992 that explored various ethnic food traditions. ​The title of Larkey’s second cookbook refers to two iconic items from the Yemenite kitchen: marak (soup), made with a beef bone to enrich the stock, and kubaneh, a yeast-risen bread that cooked overnight on the Sabbath’s eve to be ready in time for the main meal. ​ Though Yemenite food has a reputation for being limited, Larkey’s book does an admirable job expounding on its delights. The engaging text and photographs of family life in both Yemen and Israel highlight the community’s dramatic immigration story as well as their lives in each country. 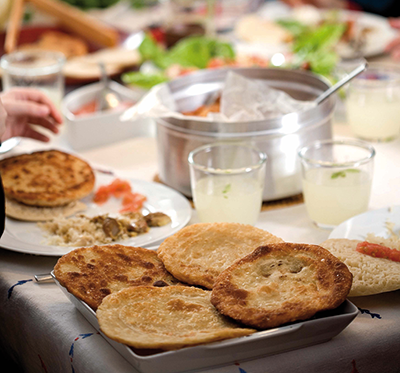 Larkey pays generous attention to Yemenite essentials like hawaiij, a curry-like spice blend used to season soups and more; s’chug, a hot sauce; and malawach, a flaky pan-fried bread that has become an Israeli comfort-food staple. She also includes recipes for crunchy, sesame-studded ka’ak biscuits and harish, a bulgur dish smothered in samneh (smoked butter) and honey that is distributed to herald a birth. ​The book’s recipes are presented according to the Jewish life cycle, highlighting foods Yemenites prepare (plus a few modern twists) for circumcisions, henna ceremonies, weddings and holidays, reinforcing how their lives hew to the rhythms of the Jewish calendar. 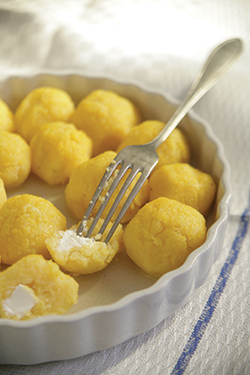 ​Shavuot—which begins the evening of May 30—is typically celebrated with dairy foods. For Yemenite Jews, that presents a challenge, but not an insurmountable one. 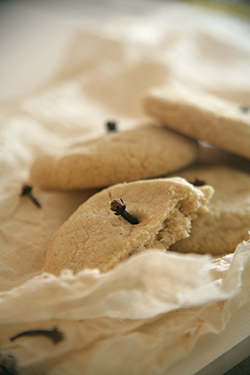 ​Another Shavuot recipe illustrates Larkey’s thoughtful approach to the origins of each dish. ‘Asit Rumi (cornmeal dumplings) are also known as Hindeh, which may suggest they have origins in India. Rumi, which means foreign, is typically used to refer to dishes with Ottoman roots. No matter the provenance—Indian or Ottoman—the dumplings are delicious, and the addition of goat cheese is Larkey’s own. ​And lastly, serving a dairy menu affords the opportunity to try the legendary malawach, which usually calls for samneh or unsalted butter, though one could substitute margarine. B’teyavon! 2. Place all the ingredients, except the cloves, in the bowl of a food processor fitted with the plastic dough blade. 3. Pulse the mixture about 6 times, scrape down the sides, and pulse another 6-8 times. Scrape down the sides and pulse again 6 times. 4. Transfer the dough to a bowl. Mash with a fork, or knead the dough briefly, until the crumbs stick together and the dough is homogeneous. 5. Form 1 1⁄2-inch balls and place them 1 inch apart on a cookie sheet. Press the balls gently to flatten and slip a clove in the center of each. 6. Bake the cookies 20 minutes, or until they just begin to take on color. Cool 5 minutes, then gently transfer to a rack to cool completely. Note: If you have too many cookies to bake all at once, form the extra cookies, place them on a baking sheet and refrigerate until ready to bake. Allow an extra 2 minutes when baking cold dough. 1. In a bowl, combine 2 cups of water and the cornmeal. 2. Bring 3 cups of water and the salt to a boil. 3. Stir in the cornmeal mix. Cook over low heat for 5-7 minutes, stirring until the mixture bubbles and thickens. 4. Sprinkle 1 tablespoon of the flour over the cornmeal and stir in. Repeat with the remaining flour, stirring after each addition. Continue cooking and stirring for another 2 minutes; mixture will become quite thick. heat and let it sit until it is just cool enough to handle; dumplings become harder to form as the cornmeal cools. the remaining dumplings in the same manner. 7. Simmer the dumplings gently in a soup or stew until they are heated through; or arrange them in a baking dish, dot with butter or margarine and bake 20 minutes at 350°. 1. Place the dry ingredients in a bowl and stir well to combine. 2. Add 1 1/3 cups of the water. Stir with a fork until the dough begins to cling together. You will want the dough to be just a bit firm, but quite flexible. If necessary, add more water gradually, a tablespoon at a time. It’s OK if it feels a bit sticky, but the dough should pull away relatively easily from your fingers. 3. Knead the dough on a lightly floured surface for 3 minutes. Cover with a damp cloth and let rest for 30 minutes. a dish. Pinch off 6 roughly equal pieces and place them on the tray. 5. Take one piece, roll it in the floured dish and then knead in your hand for about 15 seconds. Form the dough into a ball and return to the tray. Repeat with the remaining pieces. 6. Rub the tops of the balls with water and cover the tray with a damp cloth. Let the dough rest for 30 minutes. Meanwhile melt the samneh (or butter or margarine) and set aside to cool. 7. Grease your work surface and roll out one ball, rolling in all directions until it is very thin but not translucent. Pour a generous tablespoon of the shortening into the center of the dough. Using a pastry brush, brush the shortening to within half an inch of the edges. 9. Seal the tray tightly in a large plastic bag or plastic wrap. Chill 3 hours or up to 3 days. 10. Preheat oven to 200°. Remove the dough snails from the refrigerator. Grease a large circle on your work surface. 11. Use a rolling pin to press and flatten one snail, then roll out to a 6- to 7-inch circle, or slightly smaller than your frying pan. It should roll easily. If the dough is too cold to roll easily, let it warm, but do not let it get so soft that the shortening begins to melt. 12. Heat the frying pan until it is very hot. Reduce the heat to medium low and put in 1/2 tablespoon of oil. When the oil is very hot but not smoking, slide the disk of dough into the pan. Cover the pan and cook the malawach for about 3 minutes until it is puffed and golden brown on the bottom. Turn the round over and continue cooking, uncovered, until the second side is golden brown. Place the cooked round on an ovenproof tray and keep warm in the oven. 13. Finish the remaining rounds in the same manner. Malawach may be kept warm in the oven for up to 30 minutes. Serve hot.